This post is the first in a new category on Ice Cream & Wine entitled "Food Obsessions." I don't obsess over much in my life (if you don't count reality TV, celebrities, Food Network, home decorating magazines...) but there is one obsession that I'm actually proud of: my obsession with food! Now I know I'm not alone. Hello! Have you seen the endless number of food blogs out there? I can't go a day without stumbling across 17 new ones - and I absolutely love that. Anyway...back to this new category. I love food. I love learning about food. I love making delicious recipes. Most importantly, I love eating. When I come across a new food item in my life that I absolutely love, I become obsessed. So now I introduce to you my food obsession of the moment (moment is the key word, as I'll be obsessed with something else in about 8 days...). Quinoa. Come again? Quinoa. Say it with me, "keen-wah." Nice job! Can I be honest you? Ok, good. I had never even heard of quinoa until a couple of months ago. I blame Nebraska/the Midwest for being sheltered in certain ways when it comes to a variety of foods (just my opinion, folks!). Obviously quinoa is available in the Midwest - I understand that. It just wasn't a common food that people talked about/prepared. But now I live in the "big city" (haha, seriously, who am I kidding? Baltimore. Big? Eh...), and now I've been exposed to this delicious treat. 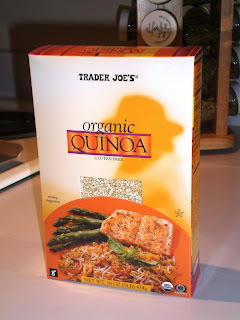 I really owe my fascination with quinoa to the amazing blogs that I follow - many of which have a focus on healthy foods. As of late, quinoa recipes have been flooding my Google Reader. My curiosity got the best of me, so during my latest stop at Trader Joe's, I bought quinoa. Ahh! I was so excited...I felt cool. It tastes delicious...seriously, that's a fact! Quinoa can be prepared following the common liquid to dry ratio of 2:1. You bring it to a boil on the stove, reduce to a simmer and let cook until the liquid is absorbed (roughly 10-15 minutes). You can create savory or sweet quinoa dishes. You can have it at dinner or even for breakfast. Basically, you can use quinoa just like you would rice or couscous. I'm officially hooked. I'll be posting my original quinoa recipe soon - I made it last night for dinner - mmm! I'm so obsessed that I'll actually be making a "breakfast quinoa" recipe tonight. Yes, realizing you have a problem is the first stage...I am addicted. I still have yet to try quinoa, but I love all the facts about it. I'm just as addicted to food as you are, it's a symptom I like to call FOTB. Food on the brain! Thanks for the add to my blog, and I look forward to your posts!